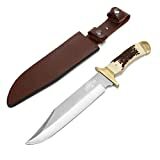 Whether you're an avid survivalist or a hobbyist looking to increase their arsenal, a bowie knife is a must-have product. And rightly soo; the iconic knife pioneered by James Black in 1830 is an essential for survivalists. The best bowie knives are go-to products for those looking for something compact and effective. To help you next time you're looking for a knife, in this article we'll list what you should look for. To do this, we will highlight some of the industry's best bowie knives and analyse their pros and cons. There are so many different factors that determine which knives are the best bowie knives. Because of this, we recommend you do your research before committing to a specific model. For example, the steel with which a knife is made is an important factor in determining its quality. The steel of the blade can determine its strength, flexibility, and also its overall effectiveness. The length of the blade is also important. Though bowie knives are generally considered to be long knives, their length can vary. It's important to understand just which type of bowie knife you're getting when looking for a new model. Another crucial aspect to look at when choosing your next bowie knife is the thickness of the blade. The thickness that you require will depend on your personal preference and what you intend to use the blade for. For example, many will prefer a thicker blade if they're interested in having stronger, more dense cuts. The handle of the knife is also an important factor for many people. This might seem like a small factor when the product is a knife, but it isn't. You should always look for bowie knives that have a full tang handle. This type makes sure that you have enough strength in the handle to keep the bowie knife from breaking. There are many reasons as to why one would specifically want to get a bowie knife over other models. To be considered as a bowie knife, a knife has to have a long blade, cross guard and clipped tip. If your knife doesn't have these features than it isn't a bowie knife! These 3 features together make a knife that has some advantages over other knives. The main reason, though, that people choose bowie knives is because of their adaptable nature. In fact, the best bowie knives can be used in a wide variety of situations! 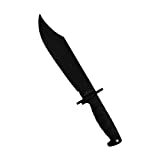 The other main advantage of using a bowie knife is the curved, sharpened tip that gives the knife it's power. This is what transforms the knife from something just used to cut into something more complex. For example, you can use the tip to burrow or skin animals. The tip of the knife can also be directed away from whatever you're cutting if you want. This is something that is also attributed to the adaptable nature of the product. A hesitation that you might have when searching for a bowie knife is the price. While it is possible to find a knife that is of a reasonable price, the quality can often vary. Stick to reputable knife manufacturers when choosing a bowie knife and you should be good. Most quality knife companies provide you with a limited lifetime warranty if your knife breaks due to a fault in fabrication. 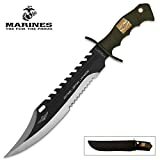 Most things to take note of when shopping are in the How to Choose a Bowie Knife section. This is because the benefits of the best bowie knives are also the features that distinguish them. Something that will help your search is taking note of the longevity of the bowie knife. ​As noted earlier, many knives will have steel that makes them very durable regardless of use frequency. Before using a bowie knife, you should acquaint yourself with the processes and strokes with which you hope to use it for. If not, you risk potential injury, making it important to understand how to use your knife. There are many great ways to use a bowie knife, but we most recommend taking it as a versatile knife. This is because you can use it effectively in many different situations. For instance, if you're looking to harvest your own birds while in the wild, you can do many things. Possible actions are skinning it, cutting it, and even cutting up the vegetables and other ingredients. A great knife to own. taking a first look at this knife has a certain wow factor that most knives miss. Out of the box, this bowie knife is razor sharp. When you hold it you can feel the quality as it lays comfortably in your hand. The down under knife comes with a gorgeous leather holster finished with an intimidating crocodile skin pattern. The holster also features a small sharpening pin. Although you're better off using a regular knife sharpener, it's a nice touch. The 11" dual heated 440C stainless steel blade itself is big, sturdy and nicely balanced. Making it capable of chopping, throwing, slicing, wedging and everything you like to do with it. Down under knives really went above and beyond when they produced this knife. finishing with a beautiful solid brass finger guard and pommel. This knife is a true functional showstopper. The Ontario Knife 8684 is a great knife to use if you're looking for something on a budget. The intuitive design of the knife makes it easy to strap onto bags and bring with you. The strong blade also makes it easy to skin animals and cut them up easily. Despite these benefits, though, the guard it comes with isn't very strong and requires great care when using the knife. The blade itself can also dull pretty quickly, not being that strong overall. The grip is also not very well-built and puts too much pressure on the muscles, wearing them out easily. Though the tip is useful for skinning animals, it isn't that durable either and can get very dull. One of the biggest complaints we had with the product was that the hilt wasn't welded on correctly. This made us unsure of the product's quality overall. Manufactured by SOG, based in Seattle, WA, this blade is the next in a line of incredible knives. SOG builds their knives with spec ops personnel in mind so you can be sure that this bowie knife get's the job done. 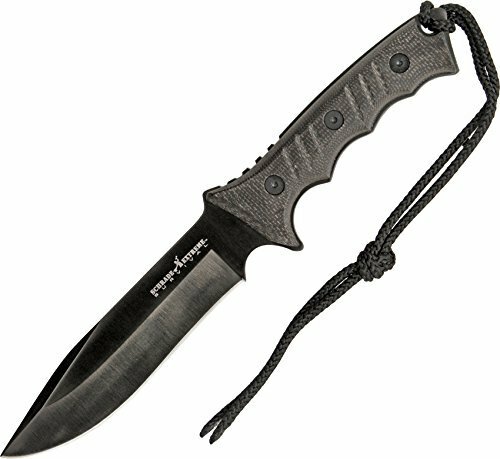 The 7" AUS-8 stainless steel blade is some of the most durable on the market. This means that the knife should hold its edge while handling your situations. The length of the blade makes it almost unmanageable at times. The most important thing to note about the knife is that it's made with cryogenic treatment. This cools the knife down to about -300 degrees F. and the slowly brings it back to normal temperature. This treatment changes the steel at molecular levels and makes the bowie knife extra strong. The handle is made from glass reinforced nylon with is designed not to slip. SOG has an incredible lifetime warranty on their products should they break during use. Just be sure not to take your knife apart because this will void the warranty. Use it normally and you should have an amazing knife in you collection. Delivered with the knife is a nylon sheath. Though you probably want to get another sheath because the standard one isn't made of the best quality. But hey, this means that all the attention went into manufacturing the knife. You get what you pay for when you buy a knife. This KA-BAR knife is a good example. The 7" long blade which features the KA-BAR famous 20 degree blade angle as well as the classic clip point. Being made from D2 steel this knife is very tough. So tough that you need a special diamond stone to sharpen the knife. Any normal wet stone won't do the job. D2 steel is one of the most durable and strongest materials on the market today. A downside to this steel is that because of the strength, the steel is very brittle. You could just snap off the tip when you are chopping through wood. Other than that this knife will handle your backyard shores as well as chopping up your food. The black rubber like handle feels comfortable in your hand, providing a well balanced grip. 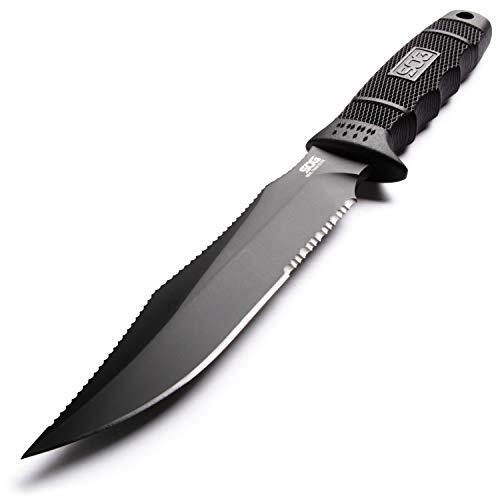 Comes with a glass filled nylon sheath to keep your knife protected and sharp. Unlike most sheaths that come with your knife. This sheath stands the test of time. High chance to snap off the tip. This bowie knife is just an impressive piece of work for it's price. The full tang 9 5/16" blade, which is made from 1095 Cro-Van steel, makes this a very heavy blade to handle. Yet the weight isn't as restrictive as you might think. The balance is superb what makes the knife controllable when you use it. The edge is great and comes paper slicing sharp straight out of the box. The leather sheath that comes with it is a nice touch but I prefer a good kydex one myself. Plus the sheath is very snug. So snug that most of the time you have difficulty closing the latch. The knife comes with a limited lifetime warranty so you can go out and enjoy yourself knowing that any defects are covered. The serrations on the back might feel dull at first but they do their job. Use them by cutting through rope and wood as needed. The grip made from black rubber like material kraton G ensures a comfortable grip when you use it. When purchasing this knife keep in mind that it isn't for sale in some zip codes in the US. It's not for sale in some zip codes. 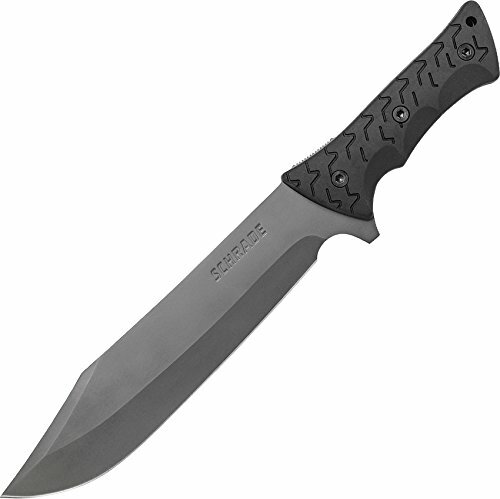 The Schrade SCHF3N black coated 6.4 inch blade is a good example of a mid range priced knife. The knife is made of 8Cr13MoV high carbon stainless steel which results in a durable knife that can handle most circumstances. The handle which features a grey micatra handle is bolted on the full tang blade with 6 bolts. The handle has deep slots for your fingers to prevent slipping in wet and damn weather. The jimping on the top of the knife makes sure that you have some extra grip when needed. The bottom of the knife has an exposed bit of tang with a piece of lanyard though it. The codura nylon sheath that comes with the knife is durable, but not a durable as ballistics nylon. It has a thin piece of nylon fabric over the plastic insert. The belt loop on the other hand has a thicker piece of nylon. The 9001022 United Cutlery Bowie Knife is affordable and durable! The company also has great customer service in the event that the knife you receive gets injured. The over moulded rubber handle is a benefit of this knife along with the blade made of AUS-6 Stainless Steel. The lightweight design also makes the knife easy to handle, weighing only 1.35 pounds. The main downside to this knife, though, is the blade design itself, which isn't very versatile for every situation. For example, using this knife to cut through woods would be difficult, while cutting meat is a breeze. The Schrade SCHF45 is a well-priced knife, giving you a good value for what you spend on it. We recommend this knife for beginners who are looking for their first long blade (overall length of 16.5 inches). This is because the blade is made of reliable 8CR13MoV titanium coated high carbon stainless steel. The knife also comes with a durable handle, making it even more intuitive. The handle, made of black thermoplastic elastomer handle slabs, is easy-to-grip and versatile. The lanyard design makes this knife unique, allowing you to attach it to various other products you might want. However, the sheath that is included is not very high quality and the blade might be too thick for some. The MOSSY OAK 14-inch is a prime choice for those looking for the best low-end model on the market. It comes with a leather sheath that is just as durable as the knife itself, something we loved when using the knife for hours at a time. The lightweight design of 1.19 pounds makes it easy to use swiftly, with the balanced tip capable of small incisions. The blade size of 14 inches is also very moderate and a good middle ground between longer and shorter knives. It should be noted, though, that the handle does not have a very comfortable grip. It can also get exhausting if used in the same position for long periods of time. 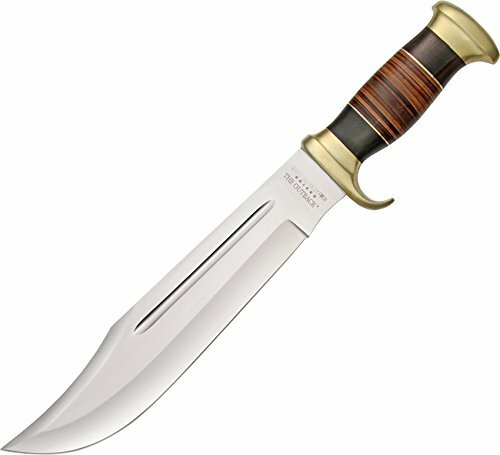 When looking at all of the best bowie knives available, it is clear that there is a great variety. We picked a variety of products to show you many perspectives, but value for your money is most important. This is why we pick the​ SOG Seal Team Elite Survival Knife as our favorite. Though it is an expensive product, we believe that the price is indicative of the sheer quality you get. There are many good lower-end knives such as the MOSSY Oak 14-inch, but you do sacrifice a bit for price.